On a breezy summer’s eve, fellow mac fanatic and undercover spy, "The Humboldt Fog," and I headed over to the Edendale Grill in Silverlake for cocktails and mac and cheese. 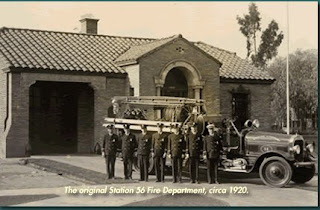 The Edendale Grill, a great spot for al fresco dining when the weather permits, is housed in a historic building that used to serve as Los Angeles Fire Station #56. The landmark, built in 1924, still has many of the original details intact, including a pressed tin ceiling, hardwood floors and truck bay doors. And here’s some neat trivia for film buffs. The name Edendale comes from the town where the very first Hollywood movie studios were situated, just down the street from the current location. Charlie Chaplin, Theda Bara, Fatty Arbuckle and legendary movie cowboy Tom Mix, to name a few, shot their very first films just a hop, skip and a jump away from the restaurant. You can view photos from Edendale’s film legacy in the lobby of the restaurant and also on the official website, http://www.edendalegrill.com/. 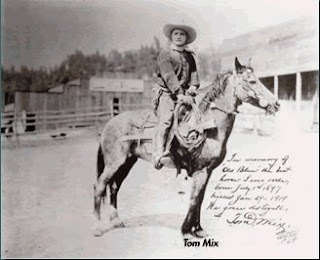 The railroad style bar, attached to the restaurant dining room through a swinging door, has its own damn name and that’s MixVille, a tribute to Tom Mix. Outfitted in dark wood and smoky mirrors, the bar acts as the main tunnel between the front and back patios. Like the Holland Tunnel between New York and New Jersey, MixVille separates the serious diners up front from the beer swillers out back. As “The Humboldt Fog” and I discovered, if you want to sit with the big kids under the stars or in the main dining room, you need to order dinner. If you want to just chillax with a cool beverage, you’re gonna' have to take it out back to the less formal patio (no table service) or grab a seat inside at the bar of MixVille. Luckily, an order of mac and cheese qualified as “dinner” and with a little negotiating, we parked it at a small table on the coveted front patio, sans reservations. And so, without any further ado, on to the mac and cheese we go. First, let’s talk price (insert drum roll)…$13. A new record! For those of you that read my last post about Hugo's mac and cheese, I deemed the dish worthy of the hefty price tag ($12.50) due to the abundance of organic ingredients and generous portion. So, by that same logic, the Edendale mac would need to meet similar criteria for the price to be justified, right? The dish arrived with a nice crispy cheese top, daintily peppered with chives. It was accompanied by a refreshing salad of field greens. Sadly, there was nary a crumb to be had on top. One demerit. If price could be attributed to temperature, then this mac would win hands down for its volcanic lava cheese sauce. Our tongues suffered third degree burns after the first bite. When we let it cool a bit and dug back in, the sharp tang of the cheddar cheese mixed with a little hint of cayenne or paprika and pasta shells gave the dish a real homey feel. Kind of like mom would make. Cheddar, which tends to sweat when heated, was the only discernable cheese and as a result, the dish had a slightly greasy glow. But here’s the kicker: in spite of the drawbacks, the mac tasted really good and when we’d nearly licked the plate clean, we were still hungry. In conclusion, I think the portion is too small for a $13 price tag. In fact, I was a bit outraged at first and thought, Really Edendale? In this economy? But then I looked at the bigger picture. Unlike the cafeteria vibe of Hugos, Edendale is a swank joint. It’s nice for a romantic dinner for two or celebratory events. It seems only fair to throw in some points and dollars for ambiance. That said, something around $10 would be a more digestible price for this mac. If you’re on a budget, Edendale may not be the best choice as it ain’t cheap. But if you want to live it up, the menu is full of comfort favorites like Meatloaf, Steak Frites, Burgers and the like. If one were to order a heavier dish as a main course with the mac on the side, it would probably be the perfect amount but, you’d still have to lay out a lot of dough for some cheddar cheese and noodles.